It can be said without fear of contradiction that Fire Protection Associations (FPAs) and their newly constituted Provincial Umbrella organisations are highly regarded in the wildfire fighting world, both internationally and here in South Africa. They are increasingly influential as a voice in government circles, are trusted by landowners across the country, and are highly respected by peripheral, but important organisations, such as insurance companies and fire fighting equipment manufacturers. They are a key component of integrated fire management, and bring together the normally disparate private, public and government sectors with a single purpose. Not all FPAs are the same, or face the same fire management challenges, for obvious reasons. In the Western Cape, and the Cape Peninsula in particular, the approach to integrated fire management takes on a particularly complex aspect, and managing this complexity falls into the jurisdiction of the Cape Peninsula Fire Protection Association, the CPFPA. The Cape Peninsula, for those not familiar with the topography, lies on the south-western perimeter of the Western Cape Province, and is a mountainous territory of approximately sixty kilometres in length by sixteen kilometres wide. It has a coastline some 100 kilometres in length and the central nature reserve area – Table Mountain National Park – is virtually totally surrounded by human habitation; the Cape Metropole has a population of approximately 3.5 million. Prior to 1998 the area comprising the current Table Mountain National Parks area was governed by no less than fourteen separate bodies. This state of affairs resulted in chaotic fire management, planning and implementation, and primarily to effect better informed decisions on fire control the Park was declared a single conservation area in 1998 under the control of SANParks (South African National Parks). An integrated fire management plan was commissioned, and as part of this plan the CPFPA was formed in 2004 – the first FPA in the Western Cape to be registered – in order to coordinate the management and implementation of the plan by incorporating the input of all stakeholders, public, private and corporate. But what is disturbing in the extreme is the pressure that is being placed on the fynbos region: no fewer than one third of the fynbos species are regarded as endangered. Table Mountain National Park has justifiably been declared a World Heritage Site. What is fynbos, or ‘fijnbosch’ as it was known by the early Dutch settlers? It is a collective term given to four species of plant; proteoids, ericoids, restioids and geophytes, and it was named for its fine stems and small leaf structure. Fynbos has no ‘trees’, being essentially an evergreen shrub flora it is not suitable for grazing purposes. It grows in soils with low nutrients and has evolved to flourish in conditions of dry, hot summers and cool wet winters. 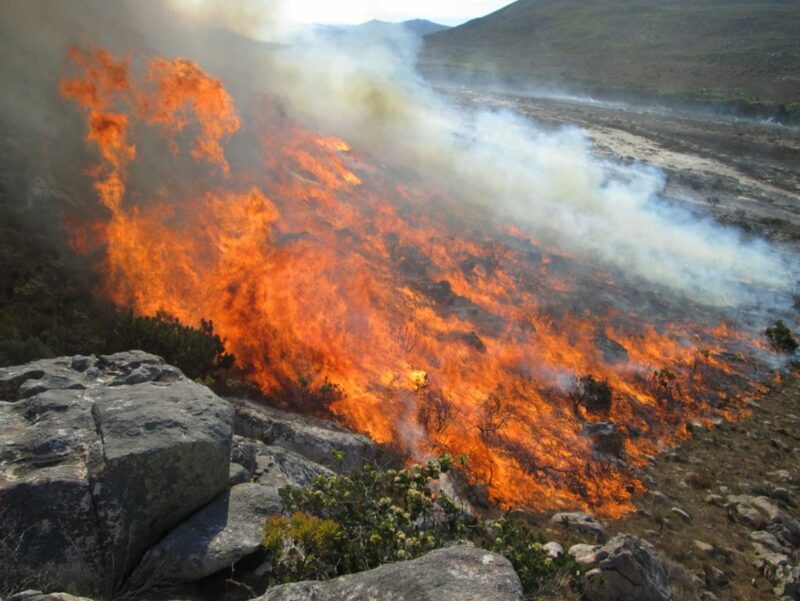 But it is the regenerative nature of fynbos that concerns the CPFPA, fire fighters and conservationists the most: it is both fire prone and fire dependent. With no fire there would be no fynbos – it is dependent on fire for seeds to regerminate or shrubs to coppice after burning. As a vegetation it is therefore ideally suited for runaway fires. It is highly flammable, its very fineness as a fuel source lending itself to quick ignition and high burning temperatures, and it thrives in a climate with winter rainfall, where it is hot, dry and windy for extended periods during the summer months. There are numerous sources of ignition, ranging from natural origins like lightning strikes and sparks from falling boulders in the montane areas through to the multiple human induced causes, mostly accidental or unintentional but no less devastating for that. Based on a study done from 1970 to 2007, only 22% of ignitions were of natural causes over that 37 year period. The fynbos fire regime is complex, and it was only in the 1970’s that research focussed on the necessity of fire in the regeneration of fynbos. It has been subsequently scientifically ascertained that fynbos should ideally burn every 12 to 15 years. This oversimplifies the process, but suffice to say that seed is set by the mature plants for successive years. After a wildfire has burned through the area, the seeds that were protected from burning by the serotinous (woody) covering of the seed cones will be further scattered by the winds and start sprouting. 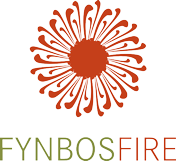 If fynbos is left too long between burnings – over 45 years is regarded as the longest acceptable interval – there is a natural senescence in the plants, flowering declines, and what few seeds there are will fall onto inhospitable ground and are unlikely to sprout. Some species will coppice, but after a very hot fire with a heavy fuel load, these plants are likely to have been too extensively burnt. What will survive are the alien plant species, and another fynbos area will have been irretrievably lost. The Cape Peninsula is not what it used to be prior to the large scale urbanisation and habitation. Areas of fynbos have been pushed into ever smaller areas of conservation, and are surrounded by a combination of flammable exotic pine forests, vineyards and, most importantly, an urban wildland interface of hundreds of kilometres around the mountain edges. Dwellings range from multi-million rand mansions to densely populated informal settlements, and each present their own specific challenges to fire-fighters. Increases in population are recognised internationally as correlating to an increase in fire frequency in ecosystems similar to the fynbos system: the Californian chaparral ecosystem as an example has suffered extensively over the past decade from accidentally ignited runaway fires. During the research period referred to above on the Cape Peninsula from 1979 to 2007, the fire return period reduced from 31.6 years to 13.5 years, a staggering drop over such a short interval. And this is an average over the full area of the Park, with certain sections burning as frequently as 2 to 3 year intervals. This, in essence, is the nature of the multifaceted difficulties facing the CPFPA and the fire fighting community of the Cape Peninsula. The fynbos needs to burn, but the people need to be protected. Runaway fires in previous years have wreaked havoc on communities bordering nature reserves, and lessons have been learnt. The fire fighting organisations in the Western Cape are all professional, highly effective and well trained, but what is needed in times of raging fires is close cooperation and an overall understanding of what needs to be achieved and how to reach that point. The CPFPA represents, and is controlled by, a cross section of concerned organisations and individuals. Headed up by the manager of Table Mountain National Parks Fire Services, the steering committee comprises representatives of these groups, ranging from the Cape Town Fire and Rescue services, whose mandate is to protect property, the Provincial Disaster Management Centre whose team will cover all eventualities including fire, to the government Working on Fire programme and volunteer fire fighting teams and private landowners who stand to lose the most in a catastrophic runaway fire. The greatest challenge, in both areas of operation, remains the urban boundary. This extensive interface is not only a challenge in terms of the effects of wildfire: it is also the greatest cause of accidental fires through human carelessness and, sadly, arson. Nowhere is the concept of integrated fire management more important than in an area that in essence a nature reserve with a circumference of fire ignition sources. The Table Mountain National Park is not only surrounded by housing, it is criss-crossed by numerous highways and byways, and is dotted with settlements both legal and illegal. As a recreational park it attracts hikers, cyclists and picnickers, and Table Mountain itself is celebrated as having the busiest summit in the world. 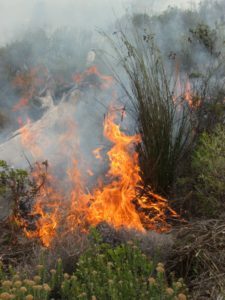 One method of preventing runaway fynbos fires is to utilise prescribed burning techniques under controlled conditions, but this practice is made extremely difficult by all the reasons cited above. Obviously, controlled burns need to be planned in conjunction with botanists who will assess the state and age of the vegetation, parks officials, landowners and fire teams, and will only take place under ideal conditions. There is considerable antipathy from press and public alike to these burnings, for reasons ranging from previous ‘escaped’ prescribed burns to general ignorance of fire management. 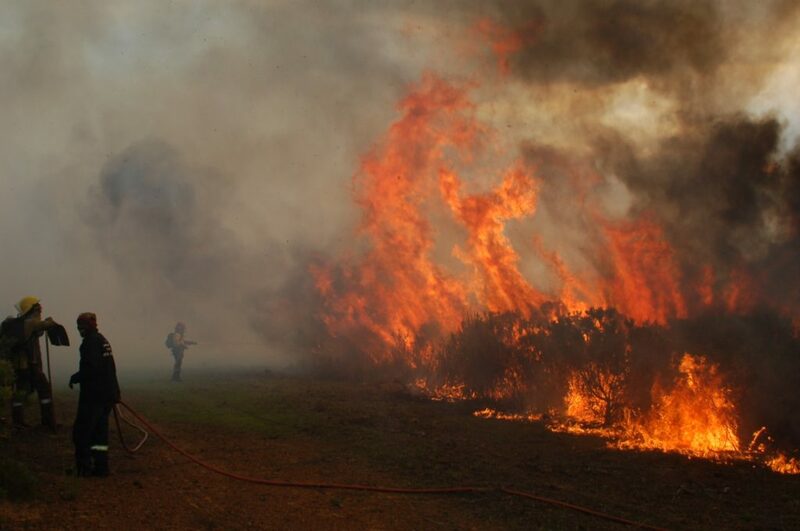 The CPFPA is the ideal coordinating and educating forum, and during the less dangerous periods around the summer fire season they are intensely involved with prescribed burns, as well as stack burning of firebreak cuttings and alien clearing. They will be the first to admit that circumstances prevent the perfect solution: many areas on the mountains are way beyond their optimal burning years, but the way forward is seen as education of the people around the urban interface, and long term planning to cover all the danger areas. 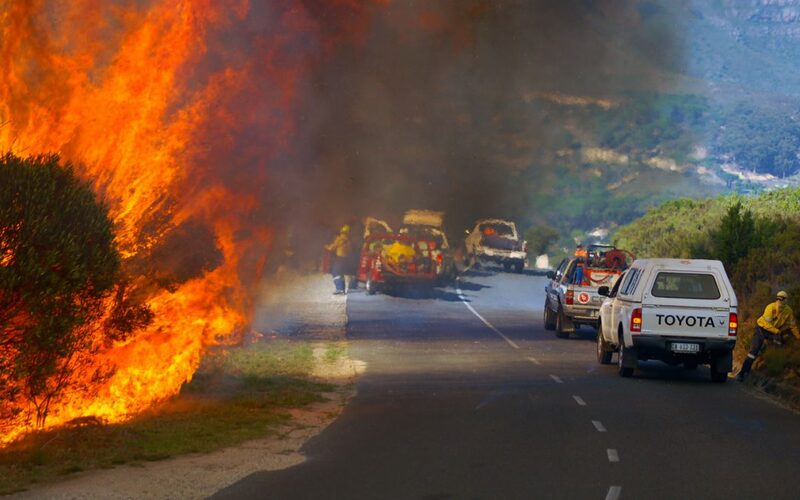 As mentioned earlier, given the inherent dangers of spreading wildfires, the fire fighting community in the Western Cape has substantial resources to draw on. Fires on the Peninsula fall under the jurisdiction of Table Mountain National Parks, whose Fire Protection Officer is also the Executive Chairman of the CPFPA. On ‘red days’ in the Peninsula it is not unusual for multiple fires to break out and even the best equipped firefighting organisations can be stretched under these circumstances. The two biggest fires on record (3363 ha and 3204 ha) both started on the same day; the 16th January 2000: 14 houses were destroyed). Fires of this nature and in the mountainous terrain of the Peninsula cannot be suppressed – or even controlled – without aerial support. Always an indispensable factor in mountainous regions, the combination of helicopters and spotter planes assisting the Incident Commander at the fires cannot be too highly praised. In these territories ground teams will always struggle to reach the fire –and there is an ever present danger of fire fighters being caught in a gorge or against a cliff face with a wind shift – and the range that extends from Table Mountain at the base of the Peninsula to the apex at Cape point is particularly steep. The only feasible method of suppression is from above, and to this end SANParks has two Working on Fire Bell UH1 ‘Hueys’ on standby at Newlands Forest Station, a point that gives quick access to the entire peninsula. There are no runway facilities on the Peninsula itself, but spotter planes are based at Stellenbosch about 50 kilometres away, and can be despatched and over the conflagration in minutes. When there are multiple fires burning, with the potential of serious loss of property, the ‘eye in the sky’ is invaluable to the central Incident Commander. Should the fire require it, there is the availability of six additional choppers from three airfields around Cape Town, all located within 60 kilometres. 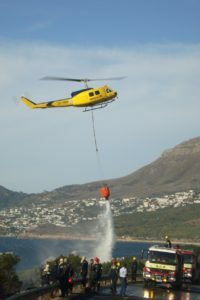 The Provincial Disaster Management Centre (PDMC) in Cape Town has recognised the necessity of aerial intervention on wildfires to such an extent that a considerable amount of funding is made available for aerial fire suppression each fire season by the Provincial Government. When deemed necessary, the PDMC will fund the first hours flying costs for all aircraft deployed on a potential runaway fire. Many potentially disastrous mountain blazes have been quickly extinguished by the aerial teams working in tandem with the CPFPA and SANParks without the Incident Commander having to concern himself with funding issues before calling on helicopter support. When an early ‘first strike’ is called for, this can mean the difference between containing a fire quickly and a ten day runaway conflagration. 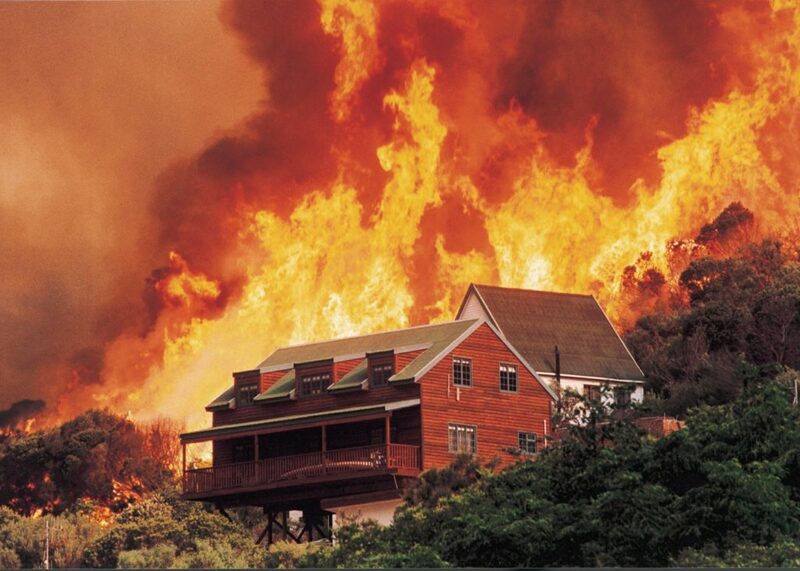 It is no exaggeration to say that without the involvement of the CPFPA, its experts and landowners, and the aerial and land based resources made available for fire fighting in the Cape Peninsula, the unique biome that is the Cape Floral Kingdom would have already been damaged beyond the point of no return. The CPFPA has struck a balance between the safety of the community and the preservation of natural resources that should please humanitarians, conservationists and botanists alike.